In this photo provided Jan. 3, 2019, by China National Space Administration via Xinhua News Agency, the first image of the moon's far side taken by China's Chang'e-4 probe. A Chinese spacecraft on Thursday, Jan. 3, made the first-ever landing on the far side of the moon, state media said. 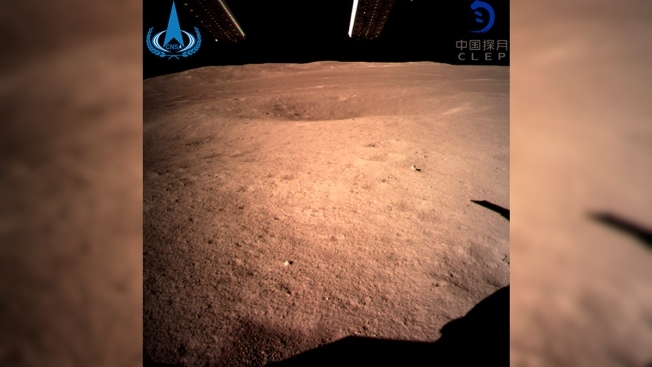 The lunar explorer Chang'e 4 touched down at 10:26 a.m., China Central Television said in a brief announcement at the top of its noon news broadcast. Three nations — the United States, the former Soviet Union and more recently China — have sent spacecraft to the near side of the moon, which faces Earth, but this is the first-ever landing on the far side. The Chang'e 4's launch on Dec. 8 has been hailed as one of the country's major achievements in 2018, and state broadcaster China Central Television announced Thursday's landing to the public at the top of the noon news. Shortly after becoming China's leader in 2013, President Xi Jinping spoke of the nation's dream of becoming a space power. "The space dream is part of the dream to make China stronger," Xi said.